My mother and I have been planning a backdrop for some crib figures I inherited some years ago from a great aunt. We started off by thinking about a stylised landscape (I might still do that one of these days), and then we thought about some sort of embroidered “stable” (likewise! ), but none of the ideas really came together. The crib figures are simple, and carved in wood, and we think they were bought in Germany after the war. 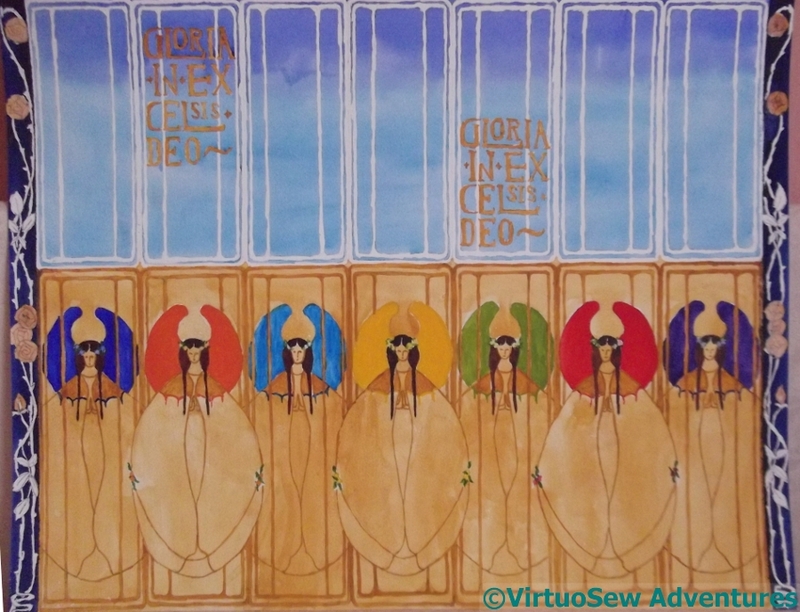 We think that simplicity might be best set off by something really gorgeous and colourful, so then my mother designed a chorus of angels inspired by the “May Queen” design by Margaret Macdonald Mackintosh. 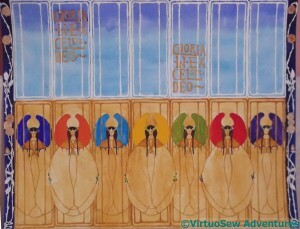 She substantially simplified the basic design, added wings and then created two ranks of singing angels. She’s also created a wonderful top panel of graduated blues and superimposed the text “Gloria in excelsis Deo” over the top. At the moment we are thinking about creating an ombré dyed section for the graduated panel, and couching gold and silver threads to make the framework. Then maybe using golden gauze for the lower panel, using a second layer for the capes. As for the wings – well, detached buttonhole stitch, perhaps? Maybe in Gilt Sylke Twist, if I can get the right colours. I’m torn between a rainbow of colours, as my mother has painted them, or some other selection. Really, it will depend on what takes my eye when I get to that stage! We want to work it on silk, and I want to be a bit clearer about what I’m doing before I get started. So it won’t be done in time for this Christmas.